For many payment companies that deliver solutions to automate payments and accounts payable, their core value proposition, infrastructure and business model are built around converting their clients’ suppliers to card payment. That’s typically the “e” in electronic B2B payments. The payment companies do so by offering a compelling value proposition to prospective customers: little or no charge for checks or ACH payments, not charging for software or services, AND providing a recurring revenue share from rebates on card interchange. Banks, who handle the lion’s share of payments, now have a tough competitor. A payment processor does not have the cost structure of the banks, who must offer fully loaded pricing for all services. Because B2B payments in the U.S. are dominated by checks (some say up to 50% of payments made), using card payments as a form of early pay can work for specific long tail suppliers and low dollar value invoices. When payment companies take on a new client, they reach out to the client’s entire supplier base and establish the type of payment that suppliers want to receive. For the payment company, the key to profitability is converting as many suppliers as possible from receiving payment by check to payment by card. Payment processors reduce their costs by using card processors like ComData and First Data to analyze their client’s Vendor Master file to see how many companies are receiving B2B payments by cards with other companies. Suppliers that do take card payments are known as “card acceptors” in the industry. According to MasterCard, 1.6% of commercial spend is made via cards versus 15% of personal consumer expenditure through consumer cards. When it comes to B2B and B2G transactions, card companies still fail to make significant inroads in capturing spend volume, even after adding all kinds of fancy virtual card and ghost card products. Why? In my unpopular opinion, there are significant benefits flowing one way to the buyer using cards, whether p-cards or virtual. These come in the form of deferring a payment by up to 55 days and rebate income provided as reward for using the card. 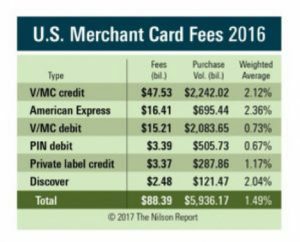 From the B2B supplier’s perspective, the card companies can talk about accelerating payment (less the cost of interchange fees, see chart below) or helping provide remittance details to settle transaction more efficiently, but that value proposition is weaker, especially for companies that are not small enterprises and have five or six figure invoices. There is also the issue of the legal structure. The challenge with B2B p-card transactions and higher dollar invoices is the pcard model for dealing with disputes is modeled on B2C transactions. As a vestige of consumer credit card practices, corporate purchase cards still put the onus of chargebacks directly on the supplier, possibly circumventing existing contracts between buyers and sellers. In a typical scenario, buyers have up to six months to dispute a transaction and push it back to suppliers. 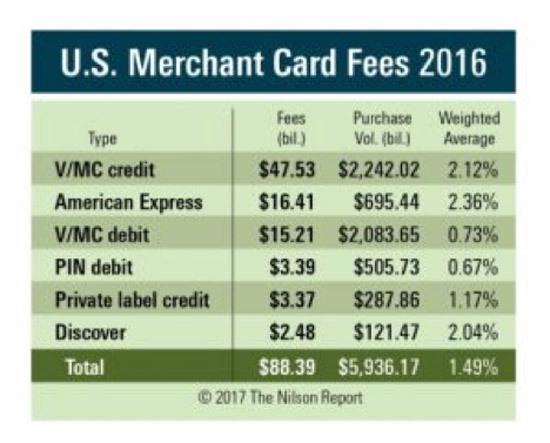 This is too long — especially if card associations and banks want suppliers to use purchase cards for large transactions that go into the millions-of-dollars range. There is simply too much risk for both the supplier and the acquiring bank to assume over such an extended period. As a result of these challenges, payment processors will eventually hit the proverbial wall converting suppliers to card — they will have all the suppliers willing to accept card payments. That raises the question of what’s next for payment companies. Our next will post will examine how payment processors can add additional early payment functionality as a complement to cards.